This is a gorgeous, huge postcard, the scan doesn't do it justice. This is part of a stamp swap with Sini in Finland last year. The Finnish Post issued a stamp sheet about Finnish rock bands last year and it included some of my favourite bands - Nightwish and Apocalyptica. 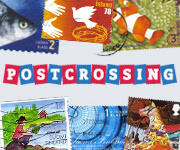 I'm not much into mint stamps so was really happy to receive the stamps on postcards (although sadly the one here didn't get cancelled, but that happens a LOT in Finland). 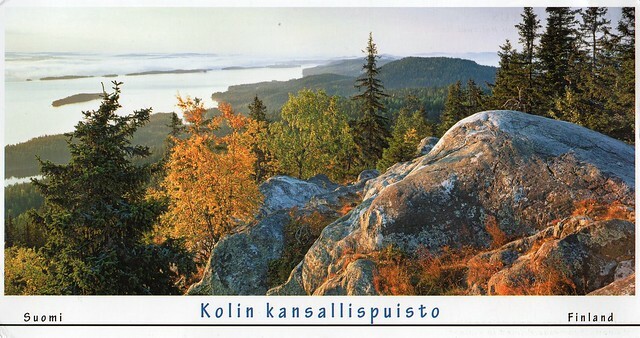 Koli National Park (Finnish: Kolin kansallispuisto) is a national park in the municipalities of Joensuu, Lieksa and Kontiolahti in the North Karelia region of Finland. It covers 30 square kilometres of forested hills on the western shore of Lake Pielinen, and was established in 1991. Contrary to the other national parks in Finland, Koli National Park was originally governed by the Finnish Forest Research Institute Metla. It is now governed by the Metsähallitus like the other national parks.